Home » What is Zumba Fitness®? Since its inception in 2001, the Zumba® program has grown to become the world’s largest – and most successful – dance-fitness program with more than 14 million people of all shapes, sizes, and ages taking weekly Zumba® classes in over 140,000 locations across more than 150 countries. Popular in homes and gyms around the world for its focus on fun, high energy fitness, a Zumba® workout burns calories and helps you to lose weight. How many calories are burned in a Zumba® workout? Workouts can vary in intensity, and calorie burn from a Zumba® session depends on an individual’s weight, fitness level and muscle composition. During an hour long session you can expect to burn anywhere from 400 to 1000 calories. What are the benefits of a Zumba® exercise workout? Zumba® keeps motivation peaked with a catchy soundtrack, plus you get the opportunity to try the moves you’ve secretly always wanted to have a go at! Music is naturally the main ingredient to Zumba® classes and helps to move the workout from one toning, strengthening or cardio move to another, targeting every major muscle group in the body. The routines feature interval training sessions which are currently recognized as one of the best ways to burn fat. The goal of a Zumba Fitness® instructor is to make you want to exercise, and to love exercise. Fun and easy to do, Zumba is the type of fitness exercise you’ll want to do every day and enjoy doing it. By the end of the class, you’ll wish you started years ago! It’s effective. Zumba® is an aerobic workout, great for overall fitness. It’s enjoyable. A Zumba® class will make you stick with the program until you get results. My class is a mix of Latin, Bollywood Flamenco, African and other rhythms that are fun to learn and easy to follow, you will sweat away the pounds with a smile on your face! You’ll be having so much fun, you won’t realize that it is exercise in disguise! This class combines the Zumba workout with lightly weighted Zumba Toning Sticks, for a whole body strengthening experience. With their rhythmic percussive sounds, these Zumba Toning Sticks will add some spice to your resistive workout routine. This class blends body-sculpting techniques and specific Zumba moves into one calorie-burning, strength-training class. You’ll learn how to use weighted, maraca-like Zumba Toning Sticks to enhance rhythm, build strength and tone all the target zones. In a very short period of time this workout will help you build coordination, muscular strength and reshape your body. If you haven’t tried this type of dance workout yet then you owe it to yourself to give it a try. The class is available to everyone, no previous dance or Zumba®experience is required. Zumba® Toning takes the Zumba® Basics class to the next level of fitness. Zumba® Toning utilizes muscle toning and sculpting exercises and combines them with the dance-fitness movements and rhythms from Zumba®Basics. The toning and sculpting exercises either use body resistance movements (for example, lunges and/or squats) and/or we utilize Zumba ®Toning sticks for added resistance. Improved muscle tone, definition and strength. Improved muscle balance and posture. Increased lean muscle mass with a reduction in body fat. What Is a Toning Stick? The Toning Sticks are hollow 1 lb sand filled with sand-like material that shifts inside the sticks as you shake them, lift them etc. It is important that the toning sticks are used in a controlled environment. 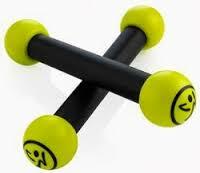 As part of the Zumba Toning program, you will learn how to use the Toning Sticks to enhance your workout! What if I don’t own Toning Sticks? I have toning sticks and small weights at the studio for you to use! Control: keeping all movements and body in control. Faster music with smaller movements will keep you safe. Body Alignment: keeping you back and neck straight at all times and keeping your knee over your ankle when doing lunges or squads. Breath: your muscles and brain require oxygen-their need for oxygen increases as you work out. Core: engaging core muscles (abs and back) at all times. Working at your own pace/Know your limits: push yourself in this class to get better results, but don’t get hurt! Will I experience muscle gain while taking the class?